Why do the weekend's fly by so fast? Sometimes they leave me feeling unprepared for the week to come. That is precisely why a dinner option like the one I'm sharing today is the perfect solution for a quick weeknight meal. Today's quick dinner idea is not only Paleo and Whole 30 friendly, which has sort of been my focus, it is also a great Vegan option! I promise I do not Spiralize with every meal I cook, and I promise that I do sometimes still prepare non-Paleo and non-Whole 30 meals for others. The meal (Paleo, Whole 30, and Vegan): spiralized sweet potato noodles with broiled Brussels sprouts, butternut squash, and cauliflower. Serving size was for one, and I was using what I had left over from my recent Instacart order that I loaded up on vegetables thinking I'd be cooking for someone else. Shopping List: Brussels sprouts, cauliflower, butternut squash (pre cut for convenience), 1/3 onion, 1 small to medium sweet potato, 2 garlic cloves, 1 to 2 tbsp of olive oil or coconut oil, garlic powder, onion powder, truffle salt, pink Himalayan salt, oregano, crushed red pepper. Broiled vegetables: To start, I broiled the Brussels sprouts, cauliflower and butternut squash 450 F for about 10 minutes. You need to watch this of course because you can scorch anything while broiling. I was successful because I had frozen the cauliflower and butternut squash from a fresh batch I used the week before so I needed it to cook faster. You can add however many vegetables as you think you can eat serving wise because with vegetables, who's counting? Not I! Once I finished the sweet potato noodles (below), I took these vegetables out of the oven and added garlic powder, onion powder, truffle salt and oregano. Sweet Potato Noodles: Wash and peel your medium to small sized sweet potato and cut off the ends so you have a flat surface on each side. Place the sweet potato into the Spiralizer. Using blade C (if you have a three blade Spiralizer) and begin to work it's magic to make your noodles. You can use any blade you want to here, I just tend to gravitate to my smallest blade which is blade C on mine. 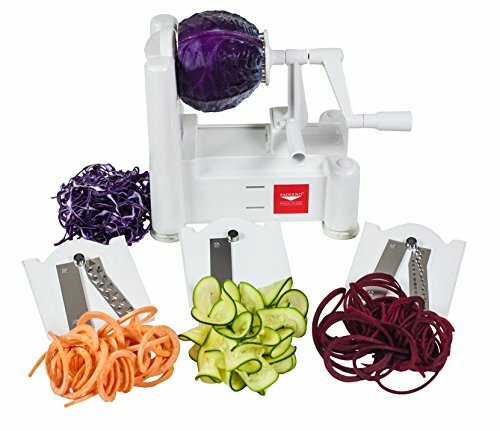 And by now I am sure you know how much I love my Spiralizer and post about just every time I share a meal. Next, saute chopped onions and fresh garlic in about 1 tbsp of olive oil or coconut oil. Once the onions begin to look translucent, add the sweet potatoes noodles (and a smidgen more oil if needed). Then I added garlic powder, onion powder, truffle salt, a tiny amount of pink Himalayan salt, and oregano. Toss the noodles occasionally while they cook so that they are evenly cooked and coated with the seasonings and oil. When both items above are finished cooking, transfer the sweet potato noodles to a plate and add crushed red pepper to top it all off. This hint of spice brings out the sweetness of the sweet potato perfectly. Add the broiled vegetables to the top of your noodles and serve immediately. HELLO flavor. I thought I'd only eat a few bites as I was struggling with no appetite that particular evening but ended up eating the whole serving! It was quite the surprise just how great the flavors all paired together, with or without my very non Paleo, non Whole 30 friendly wine.